This was a good episode, and there is finaly a 'good' episode after a long time. As much interested I was to see Phi and Hearts's childhood. There is only one scene..... Will talk about this again.. So the episode starts off with Hearts And Evel re watching Hearts vs Aiga, figuring where Hearts took the wrong move and studying the Kakusei system. Hearts was a lot frustrated. He then trains with Duo Apollos and Artemis. Then we see Phi on the top of the Dead Gran, staring at rP, saying the time has come Phoenix. Then a flashback of their childhood. Phi and Hearts were playing football, and I might add here, Phi has some serious skills for that age!! Then their father sends them beyblades as gifts through a worker. Phi had kept an eye on Dead Hades from the minute he saw it, but Hearts picked it first. Phi, holds his brother's hand and says him to hand it over to him. Hearts but doesn't care and says no. Then we see an aura around Phi.. The worker then tells Phi to take the other one. Phi asks their names and the worker replies with the names. Flashback over.. Now, you see? A scene, that' it, a 3:30 minute scene!!! I would personally have liked to know more. Back to real time, Phi enters the castle and Hearts is shocked to see him. They have a small conversation. Then we go to Aiga!! He is sleeping, shouting on top of his voice, because he was having a bad dream. If I heard right, Aiga says,"Yuruse Phi!!" ; Yuruse means sorry in japanese that means he is apologising to Phi.. I might be wrong though.. Maybe Aiga was having a dream of Phi breaking Achilles? That's why he is apologising to Phi to leave Achilles alone? Then Ranjirou comes to wake Aiga up and throws a pillow on his face!! XD This was soo funny!! This was a really good scene. After that they get up and Aiga's sister comes running to call him.. They then see that Phi and Hearts are battling!! Well, the battle was predictable. But unlike I had thought. Throughout the starting rounds Phi was absorbing Hades's power. I had expected him to get Hades and merge both of them. But nope, he just needed Hades's power. They also had a flashback where Phi and Hearts had met before and Phi says something to Hearts and walks away. And Hearts is left shouting Phi!!! That's it. These are the main things that happened. But a pretty good episode. And, Xeogran, was it you who posted a photo and said Phi on the TV Tokyo Chatroom? XD. I am sorry, but I am just curious. The Red Eye vibes are real like hell. That is literally Shu's Red Eye outfit with a few modifications!! And I love it!! Those eyes though, I just love this Phi!! That voice, that look, that persona. Damn, now I can say that the following episodes with Phi are going to be the real hype episodes for me!! Thanks for sharing Xeogran! Someone please post the episode or at least tell me where i can view it . Already seen that in your youtube channel but thanks . I adopted Hearts guys. Y'all can't stop me, I have legal papers. (Jan. 14, 2019 11:56 AM)Yohangle666 Wrote: I adopted Hearts guys. Y'all can't stop me, I have legal papers. This is one of the best Cho Z episodes in quite a while! I love this episode, after so many episodes which were just okay at best, this was really good. I wish I knew what the youngling Phi and Hearts said when they argued, but I guess I might have an idea. How did Phi and Hearts go from adorable faces to ones that can make grotesque faces? It also explains how they got their beyblades, their dad/butler had both beyblades in the box, which is when Phi and Hearts started arguing, so I guess Phi's whole "backstory" was a lie? Well anyway, Hearts is seen battling the Cho Z Eclipse beys, then Phi enters and challenges Hearts to a battle. Hearts always seems a bit worried when Phi comes for some reason. Hearts seems to be in the lead with two Over Finishes I think? Then Phi seems to get the upper hand, but he also seems to drag out a few battles by making them double Over Finishes. During the battle Phi seems to be absorbing the power of Hades little by little, and while I would comment on how ridiculous this is for Burst, it's already way past that point, it's a really entertaining battle anyway. Then when Hearts uses Defense mode and uses Dead Gravity, Phi unleashes his dark power and only the armour on Phoenix comes off and stops the Dead Gravity. Phi uses his Armour + Phoenix Break to crush Hades and... AHA I KNEW IT, I figured Dead Hades would break! Oh wow Phi has a vendetta against RBV beyblades doesn't he? Hearts seems horrified over it but I wish we got to see more reactions to him. Aiga sees this in the broadcast and gets really really angry as it reminded him what happened to his Z Achilles. Phi then picks up a piece of Hades and then... it suddenly shows it turns to Dead Phoenix, alright then? I hope it doesn't use 0.At here. Evel seems happy with this, showing no loyalty on his part. Overall, a really good episode, enough to get me to review them once more. By the way that new outfit Phi wears definitely looks like Red Eyes outfit, and a slight mix of Hearts outfit. For the first time in beyblade I wonder who the final boss is gonna be? I always thought it would be Aiga vs Valt but now I don't think so lol. 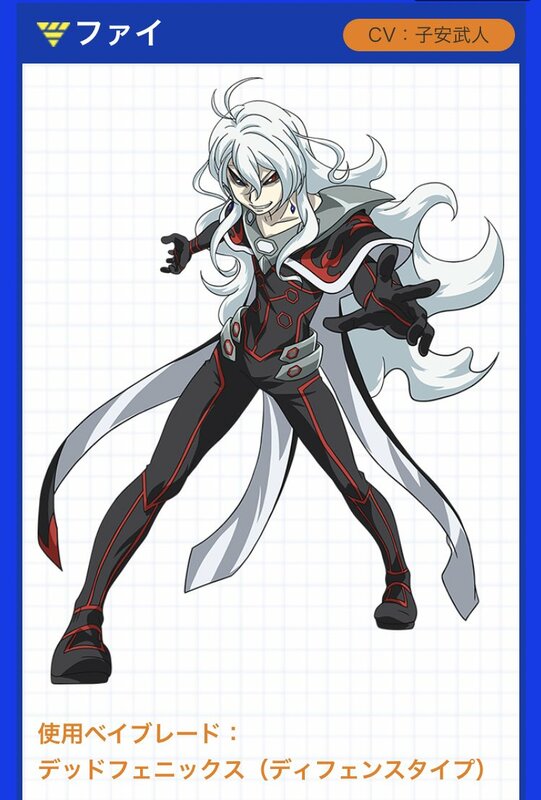 (Jan. 14, 2019 6:17 PM)Limetka Wrote: For the first time in beyblade I wonder who the final boss is gonna be? I always thought it would be Aiga vs Valt but now I don't think so lol. Probably Valt vs Aiga with Valkyrie getting destroyed again. you know phi just level up with the number of being getting destroyed, shu destroyed to beys nemesis and the major the reboot driver and longinus while phi destroyed leopard and the major Hades and Achilles, interesting that vothe not only destroyed a major bey but also damage or destroyed the main character beys or driver respectively. i also been thinking they could've made an interesting story with evel like he was silver eye from the beginning after all he literally share the same goal as Alexander/Theodore from the god series both wanting to create the ultimate bey. so it would've been a great way to connect them as partners. and that whole phi and hearts being alien and immortal pretty much confirm their not after seeing that episode. (Jan. 14, 2019 7:37 PM)God Dragruler Wrote: you know phi just level up with the number of being getting destroyed, shu destroyed to beys nemesis and the major the reboot driver and longinus while phi destroyed leopard and the major Hades and Achilles, interesting that vothe not only destroyed a major bey but also damage or destroyed the main character beys or driver respectively. i also been thinking they could've made an interesting story with evel like he was silver eye from the beginning after all he literally share the same goal as Alexander/Theodore from the god series both wanting to create the ultimate bey. so it would've been a great way to connect them as partners. and that whole phi and hearts being alien and immortal pretty much confirm their not after seeing that episode.